It's more fun in Yiddish! This book teaches you to read Yiddish as it goes along. Starting off with only the occasional word, it gradually introduces phrases, grammatical constructions, and whole sentences, until the very last chapter is 100% Yiddish. We've posted 23 exerpts from the book, including MP3 VOICE CLIPS so you can hear what the Yiddish sounds like! Words that are introduced for the first time are translated in parentheses, unless their meaning can be easily guessed by the reader...for example, in this passage, the reader is supposed to figure out that a khasseneh is a wedding. When a word or phrase appears in quotations or italics, it sometimes means that the reader is not expected to guess the exact meaning, but merely to get the general drift. In this example, the reader should understand that a khasseneh with all the "sheva brokhos" is, in some sense, a "proper wedding"; and his understanding of the passage as a whole does not depend on any specific knowledge of the "seven blessings" involved in a traditional Jewish wedding. 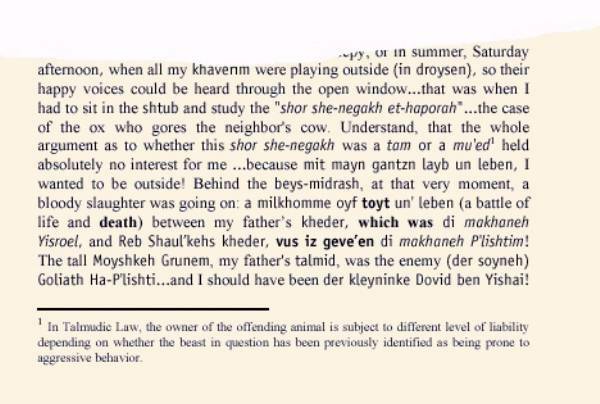 In this passage, the reader is to understand that her father’s former home had been a frequent meeting-place for religious Jews; that "der Yoyzel" is a not-too-complimentary reference to the icons hanging on the walls of the typical Gentile home; and that Zolf’s mother adamantly refuses "to let the mezzuzahs be torn from (her father’s) doorposts", that is, to let her home be occupied by Christians. Here we get some idea how much Hebrew was invovled in the study of Talmud. Remember that young Zolf was only ten years old in this incident, yet he is already expected to learn abstruse legal concepts and principles! 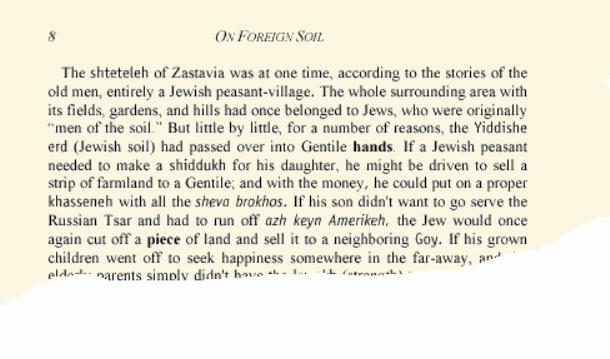 Note also the use of parallel grammatical constructions to hint at the meaning Yiddish phrases, as exemplified by the passage: "...which was (the camp of Israel)......vus iz geve'en (the camp of the Phillistines)...".The reader who is sensitive to such techniques will find the Yiddish much easier to decipher. The City of Brisk attracted every kind of travelling preacher and story-teller (see "A Fire-and-Brimstone Preacher"). Here the author recalls the feeling of being transported on words back to ancient Egypt, where the Patriarch Jacob lies on his death-bed in the presence of his twelve sons. Joseph, the youngest, the King’s Minister, has just brought forward his two sons Menasseh and Ephraim to receive their grandfather’s blessing. Young Falk has taken refuge in the Town of Molodetchno when news arrives that the Czar has ordered the deportation of all Jews from the Lithuanian front. The Jewish townsfolk witness the first convoys of railroad cars packed with deportees. They rush to the train station to bring food and water to the starving Jews, but are forced back at the train station by armed guards! Apparently, the local authorities have ordered that no food is to be allowed to these "enemies of the Fatherland".